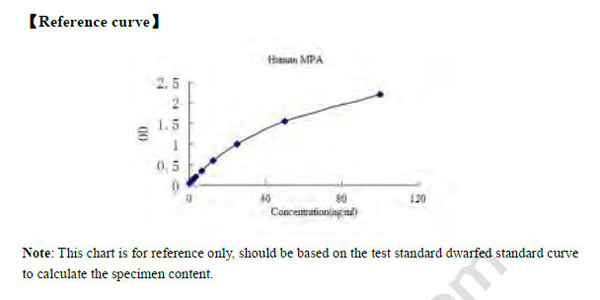 Intended UseHuman MPA ELISA Kit allows for the in vitro quantitative determination of MPA , concentrations in serum, Plasma , tissue homogenates and Cell culture supernates and Other biological fluids. specificalIntended Uses: This product is suitable for in vitro quantitative detection of human serum, plasma or cell culture supernatant and organizations in the natural and recombinant MPA concentration. Principle of the Assay||This experiment use double-sandwich elisa technique and the ELISA Kit provided is typical. The pre-coated antibody is human MPA monoclonal antibody and the detecting antibody is polyclonal antibody with biotin labeled. Samples and biotin labeling antibody are added into ELISA plate wells and washed out with PBS or TBS. Then Avidin-peroxidase conjugates are added to ELISA wells in order; Use TMB substrate for coloring after reactant thoroughly washed out by PBS or TBS. TMB turns into blue in peroxidase catalytic and finally turns into yellow under the action of acid. The color depth and the testing factors in samples are positively correlated. Inquiry About Human MPA ELISA Kit If you hope to order it or contact us directly, please contact us via sales@biobool.com. We will get back to you in 12hrs,Thanks!